The skin of our body needs hydration and daily care to maintain its natural balance and delay the cellular aging. 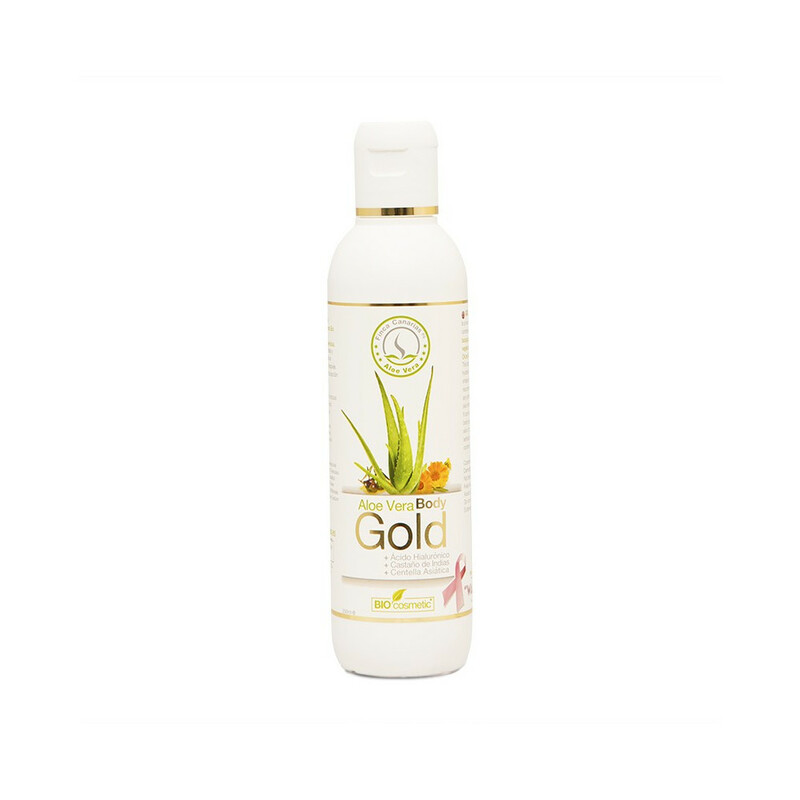 Aloe Vera Gold Gel is formulated as a daily use body moisturizer based on Pure Aloe Vera Juice, Urea, chamomile extract, horse chestnut oil and other vegetable oils rich in essential fatty acids. It is also enriched with vitamins A, E, H and vitamin B5. Urea is a natural substance in the body that is found in the upper epidermal layers of the skin, providing the flexibility to keep it soft, supple and crack-free. When the level of urea in the body is decreased, due to environmental factors such as extremely dry or cold weather, or due to the appearance of certain skin disorders such as eczema or psoriasis, the natural humidity of the skin surface can be seriously reduced. This can be translated into a flaked and cracked skin, which will produce will produce an uncomfortable itching and stinging sensation. Urea is therefore a “must” component for the surface of our skin. In addition, chamomile extract and Aloe Vera fresh juice show soothing, anti-inflammatory , healing and antimicrobial properties. That is why, they can soothe any skin condition, restoring skin 's natural balance. On the other hand, horse chestnut oil is very effective when treating broken capillaries. It helps to increase blood flow and it shows astringent and anti-inflammatory effects on the veins around the body, which tightens and tones the walls of the damaged and irritated veins. As it removes the liquid that have come out of the veins, it reduces the local swelling. The fusion of these natural ingredients help to regenerate tired and aged body skin. It maintains the appropriate levels of hydration, bringing vitality to the skin and providing a silk touch and a pleasant perfume. Apply generously and uniformly after exposure to sunlight, preferably on clean and dry skin. One application a day is enough to hydrate, regenerate and revitalize your skin. This Creme is perfectly suitable for use on children's skin. Its natural formula can be applied to sensitive skin. All our products contain Aloe Vera Pure Juice, pressed in cold, so it is recommended to store them in the fridge once opened.